As always, our artisans and farmers have already been paid in full. So, why do we say that? And what does it mean? We're glad you asked! How—and when—we pay our suppliers is a key distinction between Serrv and other brands, even those self-described as fair trade or ethical. It's a business practice to which we are wholly committed, and of which we are most proud. 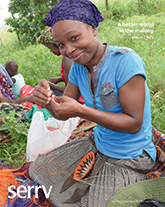 Advance payment allows these basket weavers with Trade Aid Integrated in Ghana to purchase straw in bulk, reducing cost and increasing year-round employment. Photo: Serrv. Every artisan or farmer group we partner with is given the option to be paid 50% at the time they confirm our order, and the remaining 50% when the order ships. (All but a few of our partners choose to be paid this way.) Our partners always set the price for their products, confirming accuracy and fairness as calculated by their country's specific living wage and the Fair Wage Guide. As a founding member of the World Fair Trade Organization (WFTO), Serrv adheres to the fair trade principle requiring prompt and fair payment to suppliers. These interest-free payment terms mean that Serrv pays its suppliers in full before products are even received. Compare that to typical U.S. wholesale terms, which may be as much as 30 to 120 days after delivery, and you begin to appreciate this key difference in our method of payment. Regular, sustainable payments give groups like VillageWorks in Cambodia opportunities to take on larger orders. 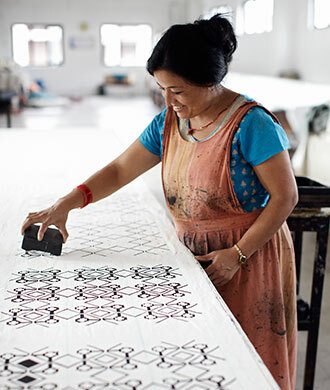 This often means they are able to hire more fair trade artisans. Sustainable incomes. Providing consistent and reliable incomes is vitally important to our artisans and farmers—and to many other marginalized citizens around the world. According to recent statistics from The World Bank, 767 million people, or 10.7% of the world's population, are estimated to be living below the international poverty line of $1.90 per person per day. There is no financial cushion for these individuals, many of whom are also supporting children and other family members. Waiting to receive payment until after a product is delivered is simply not an option for these families. Paying 50% in advance allows our artisans and farmers to have sustainable incomes as they develop, craft, and package Serrv's orders. Nyabigena Soapstone Carvers in Kenya use advance payments to mine and transport soapstone, which requires renting a truck and traveling more than 200 miles to the quarry. Raw materials and supplies. Paying in advance also allows artisans and farmers to purchase raw materials and supplies without having to take out high-interest loans. For smaller artisan groups, especially, this allows them to take on larger orders they might not otherwise be able to fulfill. These larger orders help our partners grow their businesses and their staff, lifting more individuals out of poverty, creating sustainable businesses and communities. Smaller artisan partners such as Union Progresista Artesanal in Mexico, which employs 18 individuals, often have no financial safety net should things not go according to plan. Serrv helps by assuming the financial business risk, paying 100% for all orders before we even receive them--and regardless of how they sell. Reducing Risk. Advance payments also removes business risk for our partners. 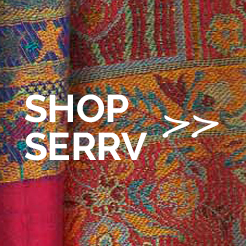 Because we pay our artisans and farmers 100% of their fair trade payment before their products arrive in our warehouse, Serrv assumes the financial risk should a particular product not sell as well as expected or if it's damaged in shipment. Once we have the products in hand, we may choose to offer sales on those products at some point, but those discounts always come out of Serrv's bottom line. Our artisans and farmers are never paid less than their full fair trade payment, regardless of the discounts and sales we may offer. Sustainable, fair trade wages for artisans like Naseema with Tara Projects, India, help provide educational opportunities and health benefits for children. Paying artisans and farmers regular, sustainable wages is just one of the ways we support the organizations and individuals behind our products. Doing so is an important step toward helping our partners build stronger businesses, leading to stronger families and communities worldwide.